OPERATOR of hotels, lounges and cafes, Residence Hotels and Resorts Sdn Bhd (RHR), expects business to grow by between 10 per cent and 15 per cent next year, as it grows its portfolio of properties under management. RHR, best known as the operator of Best Western Premier Seri Pacific in Kuala Lumpur, will in 2009 add a hotel in Mecca, Saudi Arabia, a club house, a cafe and a convention centre under its management. 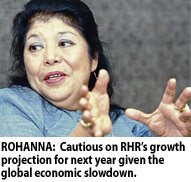 Managing director Rohanna Ramli said that she was cautious on RHR's growth projection for next year given the global economic slowdown. Revenue in 2008 is estimated to grow by a fifth over 2007. "We have signed a management deal to operate the Fal Al-Saha Hotel in Mecca starting February 15 2009. It is a four-star hotel located 300 metres from the Holy Haram," Rohanna said. "We will also operate a Club House in Nusajaya and a Cafe in KL Sentral which are both under UEM. We will also be operating a conference centre which will be ready next year," Rohanna said. The newly refurbished Best Western Premier is expected to contribute to the higher revenue as the hotel raises rates to between RM230 and RM250 a night from RM205 a night this year. Rohanna was talking to Business Times following a a signing ceremony between the 560-room Best Western Premier and 1,259-room five star Sultan Hotel in Jakarta. The parties, represented by Sultan Hotel's general manager Jean Wasser, signed a memorandum of understanding to collaborate on cross-selling between both properties. The partnership will also entail image building, food promotion and exchange of staff. Meanwhile, Rohanna said that plans to manage a hotel in Mecca has finally materialised after some eight years. In the first year of operations, Rohanna hopes to achieve an average occupancy of 70 per cent and a gross operating profit (GOP) of 30 per cent. Hotel occupancy and rates in Mecca fluctuate depending on the Ramadan, Haj or Umrah period. According to Rohanna, hotel rates are at their peak during the last 10 days of the fasting month. "The rates are RM30,000 for 10 days or RM1,500 per person per night ... guests are charged for all 10 days whether they stay one night or all 10. If it is triple, room charges go up to RM4,500 a night," she said. And in the low season, room rates are about RM200 per night per room. Following the group's move into Mecca, Rohanna hopes to be able to manage a hotel in Medinah in the future. Locally, RHR is exploring Kota Kinabalu, Sabah and Penang for future hotel management contracts. It also manages the Residence Resort Paka in Trengganu; Residence Desa Lagoon Resort in Port Dickson; MAS Golden Lounge in KLIA and Langkawi; MAS Academy in Kelana Jaya; Bank Negara Malaysia's Sri Kijang in Langkawi and Lanai Kijang in Kuala Lumpur. The iProperty.com Group has launched a regional property magazine, iLuxuryasia.com, to provide an integrated marketing platform for Asia’s luxury real estate. Executive chairman Patrick Grove said in a statement that the magazine is designed to equip buyers with the know-how to confidently purchase real estate and to make informed investment decisions. Grove said iLuxuryasia.com also features information such as legal and financial tips and country specific guides on buying procedures. IPOH: Perak’s 149,000 people living in 349 planned and 134 new villages on land valued at over RM1.5bil can now apply for their freehold titles. The villagers can also expect the titles to be issued between two weeks and a month. Senior executive councillor Datuk Ngeh Koo Ham said the state government has shortened the process of applying for the freehold titles after the Perak Valuation and Property Services Department assessed the value of the areas. “We want to make it the simplest possible and quickest process. We don’t want to implement it hastily only to be bogged down by problems later,” he told reporters here yesterday. Ngeh: Process of applying for the freehold titles shortened. Ngeh pointed out that the 20 processes for the application earlier on had been simplified to four steps. The shortened process allowed an applicant to obtain the title within the day itself, he added. Ngeh said the new process could also resolve problems, such as for those who had paid premium for the last 10 years but still had not been issued with a title or cases of missing files after paying premium for the past 30 years. “The issuing of freehold titles to the 102,000 in planned villages and some 47,000 in new villages could bring in revenue of between RM300mil and RM450mil for the state,’’ said Ngeh. On whether the issuing of freehold titles to those living in planned and new villages was against the National Land Code, Ngeh said it was not. “The state consulted a former Court of Appeals judge and a panel of experienced lawyers on the matter before implementing the move,’’ he said. PETALING JAYA: Axis REIT (real estate investment trust) is eyeing more office and industrial properties in the Klang Valley and Johor next year to expand its existing portfolio of 19 properties. Malaysia’s first listed REIT expects rental rates to hold steady in 2009 due to tight supply, although it also sees a slower growth rate, says Axis REIT Managers Bhd chief executive officer and executive director Stewart LaBrooy. It was a matter of assessing the right time and opportunities before Axis REIT embarked on its expansion plans, he said, without disclosing the number of properties and their locations. According to LaBrooy, Axis REIT has always held the view that cross-border investments carry much higher risks for a property trust, thus it does not plan to acquire overseas properties for now. On the outlook for rentals, LaBrooy said Malaysia was fortunately not part of a property bubble that had become evident in Singapore, Vietnam and Dubai, and that the domestic market would be stable. “We foresee the rentals for industrial and office properties in Malaysia holding steady for 2009 due to the tight supply currently,” he said, adding that much of the industrial and office properties coming onstream in 2009 had been pre-leased. “For industrial properties, we have seen rental growth of 10% upon renewals in 2007 and 2008, whereas in the office sector, rentals have grown by 15% to 20% over the past 12 months,” he said. Currently, Axis REIT’s monthly rentals range from RM1 per sq ft for industrial space to RM4 per sq ft for top-end commercial space. However, Axis REIT expects a slower rental growth rate in 2009 due to the current downbeat economic climate. Nevertheless, LaBrooy expects Malaysian REITs (M-REITs) to offer investors the opportunity to earn 11% to 13% returns. “Investors who are taking the opportunity now will be buying prime assets at a discount where the real market prices haven’t moved,” he added. Labrooy acknowledged that M-REITs had taken a beating, in tandem with the selldown in global markets, including Malaysia’s. “Despite this, M-REITs are still posting positive earnings growth and with their conservative leverage and attractive returns, they still have a compelling investment story,” he said. Axis REIT posted its best results since its listing in the third quarter, reporting an earnings per unit of 3.85 sen, compared with 3.75 sen in the preceding quarter. For the nine-month period, it made 11.36 sen per unit, the highest in the industry. MALAYSIA'S property-to-financial company Mulpha International has raised its stake in Australian property developer FKP Property to 22.8 per cent, Mulpha said today. The Malaysian firm said it acquired another 43 million FKP shares for RM235.8 million (US$64.83 million) from the open market and by buying new shares issued by FKP. It owned 37.12 million shares in FKP prior to the acquisitions. The company said it has obtained the approval of the Foreign Investment Review Board of Australia to acquire up to 37 per cent of FKP shares without undertaking a mandatory general offer. Under Australian securities rules, the trigger point for a mandatory takeover offer is 20 per cent. The International Trade and Industry Ministry is seeking another RM200 million to undertake aggressive trade and investment promotion missions, said its minister Tan Sri Muhyiddin Mohd Yassin. The allocation, which has been proposed to the Cabinet, will be used by the Malaysia External Trade Development Corporation, the national trade promotion agency, and Malaysia Industrial Development Authority (MIDA) over two years. "The softer investment and trade numbers should be taken as a sign that more aggressive promotions need to be organised to explore potential new markets like the Middle East, Africa, South America apart from neighbouring China and India," he said after launching the national economic outlook conference by the Malaysian Institute of Economic Research. MIDA is working on an investment mission drive to tap areas with excess or surplus capital. "In the Middle East, for example, we will have special missions during which we'll bring to them potential specific projects," he said. These will include real estate, commercial development, and power generation. He also asked the private sector, including the Federation of Malaysian Manufacturers, to present specific proposals on how the government could help them. The manufacturing sector, which accounts for 30 per cent of the total output and employment and over 70 per cent of total exports, grew by around two per cent in the third quarter of the year. Muhyiddin remarked that although manufacturing exports showed weakness, domestic industries continue to register strong growth, in particular, the transport equipment, construction-related products and food industries.